Nine out of 10 cat-in-a-tree rescues I do involve beloved family cats. Arbol was only my third "unknown" cat rescue. I got a call on a Saturday night from a nice woman representing a small country cul de sac community. They had found a cat in a tree along their road by following his cries and had anxiously kept vigil for an entire week hoping he would come down on his own. When it became clear that he wasn't able to come down by himself, they called animal control who gave them my number. Despite many attempts, the group was unable to find out who, if anyone, owned the cat, and each family was reluctant (understandably) to keep the cat in their home for observation after the rescue. We decided that given the circumstance it would be necessary to let the cat go after the rescue and hope it made its way back to its home. 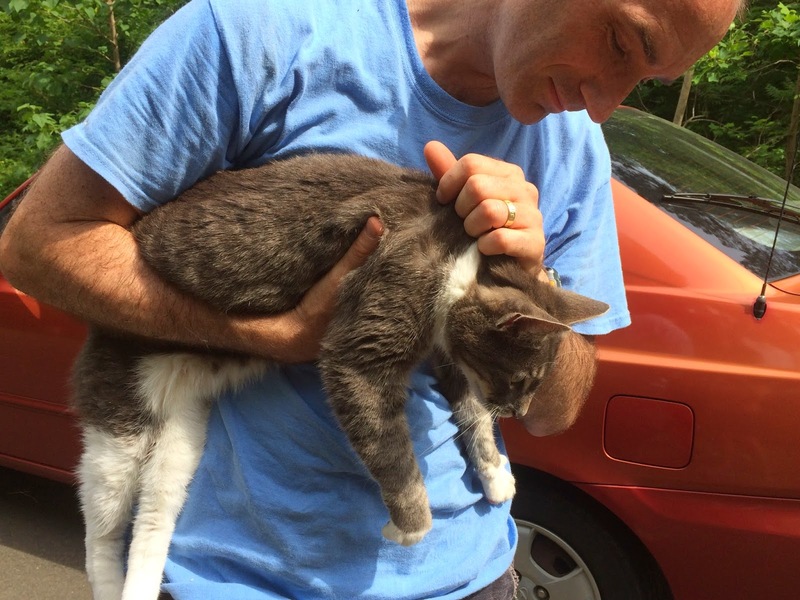 I came out on day 8 to perform the rescue, but before doing so, I sent a last minute request via Facebook to see if anyone was willing to keep the cat over the Memorial Day holiday. That would give us time to make sure the cat could get some food, rest, and recovery as well as allow us to get the cat to a vet to check for a microchip. 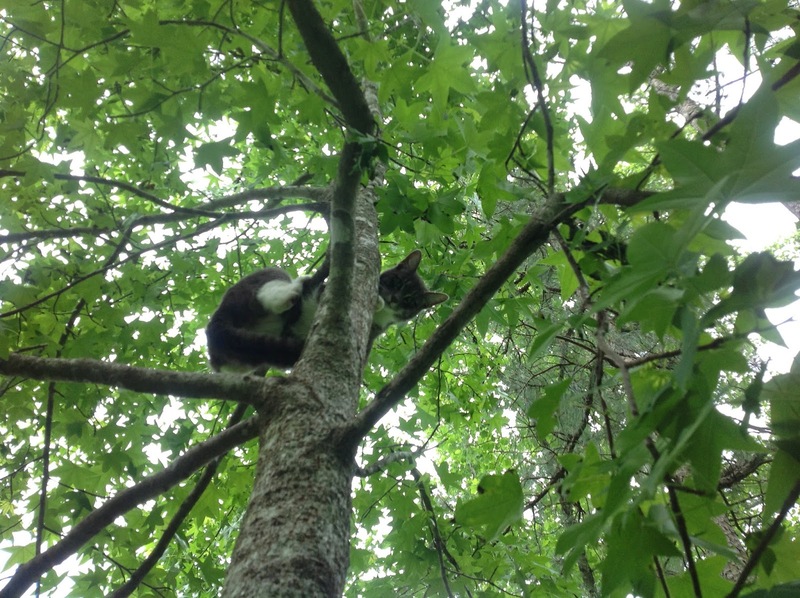 When I arrived, I found the cat about 35 feet up in a small sweet gum tree with puny branches. Fortunately, I was able to climb a much taller pine tree nearby and swing over to him. During the rescue I posted a picture to Facebook, but there were still no volunteer foster families by the time I got him down. Back on the ground, we transferred him to a waiting cat carrier stocked with food and water and he gobbled down 2 cans of food in about 5 minutes. With no volunteers stepping forward, we opened the cage after a few minutes to let him out. To our surprise he started rubbing up against everyone as if to say Thank You! He even let me pick him up! Before saying good bye, I checked Facebook one last time and was delighted to see that someone had volunteered to keep the cat for a couple of days and take him to the vet for a chip scan! Unbelievably, the cat let me put him back in the carrier! During the 20 minute drive to the foster home he fell fast asleep. The foster family kept us all up dated as the cat recovered. Each report of eating, drinking, playing, peeing, and pooping was met with cheers and relief. (Spanish for "tree"), brushed him, trimmed his nails, and removed two ticks. Through all of this he never scratched, hissed or complained. Our initial efforts to find his owners were unsuccessful and we didn't want to send Arbol to a shelter and risk him being euthanized so we kept him with us until we could make a long term plan. The picture to the right shows Arbol sleeping contentedly on our bed. Three weeks to the day of Arbol's tree rescue we got a call from a family saying they saw one of the "Found Cat" signs I had posted near the rescue site. 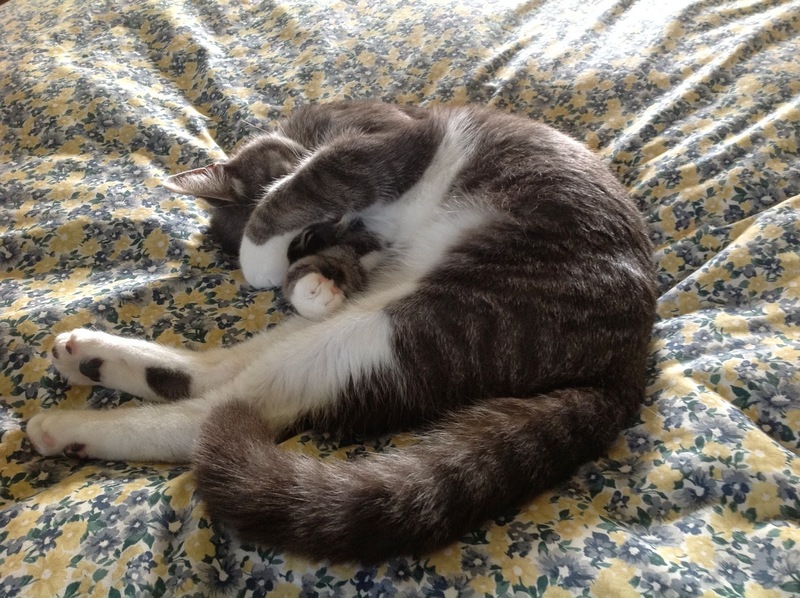 The young boys in the family had been crying themselves to sleep for 2 months since they lost their cat, Luke. Since the rescue Arbol had been living with us and we had gotten pretty attached to him. He and our 2 resident cats were not very compatible, however, so finding the owners was the best possible outcome. It was hard to say goodbye, but the happy reunion of Luke with his loving family melted our hearts.